Great whites are fearsome predators. Intelligent and efficient, they hunt with speed, force, and deadly precision. Meet the king of sharks. Ten times the size of most sharks, the great white is truly massive. While the common size range is 11 to 16 feet, the largest accurately measured – caught off Prince Edward Island in 1988 – was 20 feet in length. 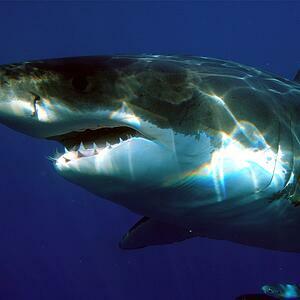 Learn more about the Great White. Image from Wikipedia. This color palette showcases the strength and power of the great white shark and pays homage to the deep oceans where it resides. 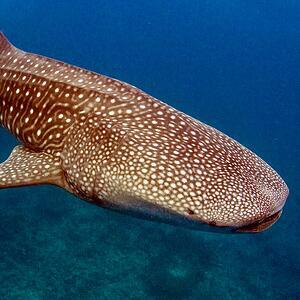 No shark – and in fact no living fish – is larger than a whale shark. A typical whale shark measures 18 to 32.5 feet in length. These sharks may be huge, but never fear, they come in peace. The whale shark is one of only three filter-feeding sharks. Though their mouths are sometimes nearly 6 feet wide, they don’t eat big things, but rather gulp large quantities of water full of plankton and small fish. Read more about this gentle giant. Image from X-Ray Magazine. The soft, warm colors of this palette reflect the gentle, friendly nature of the whale shark. 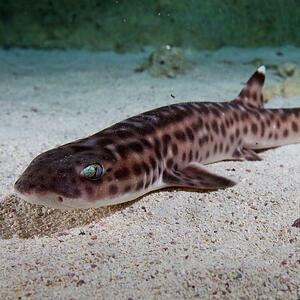 The marbled shark is also known as the coral catshark. The name comes from the cat-like shape and the color of the eyes (a beautiful metallic green). A relatively small shark species (at around 2.5 ft), the coral catshark lives within shallow reef communities, where they feed on invertebrates and small fish, and often rest within the coral. Image from the New England Aquarium. The subtle green in the eyes of the coral catshark makes a vibrant addition to this color palette, coupled with warm neutrals. These zebras lose their stripes! As juveniles, these sharks have dark bodies with yellowish stripes. 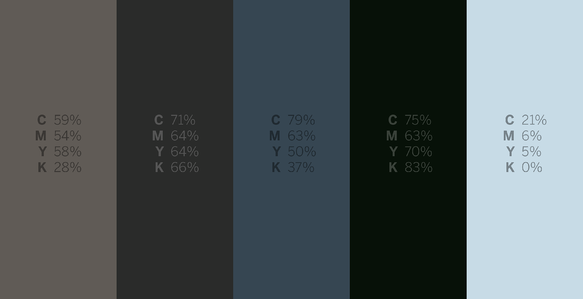 As they mature, the pattern changes to small dark spots on a grayish-tan background. 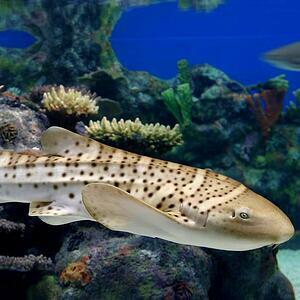 Because of this, zebra sharks are often mistakenly referred to as leopard sharks. Two more features distinguish the zebra shark: the prominent ridges running the length of the body, and the impressive tail, which is nearly as long as the body itself. Learn More. 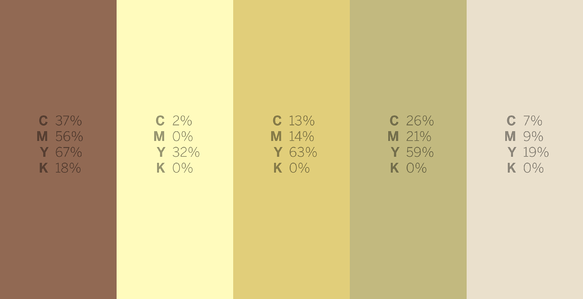 Image from the Finformation. 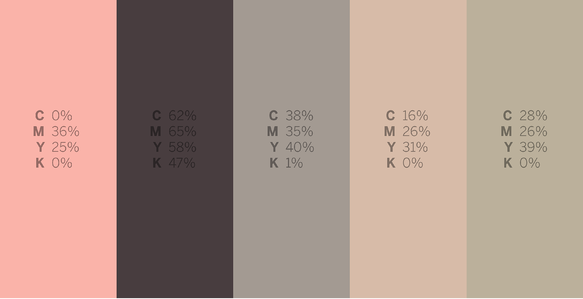 This palette features subtle neutrals, showcasing the essence of the elegant zebra shark. 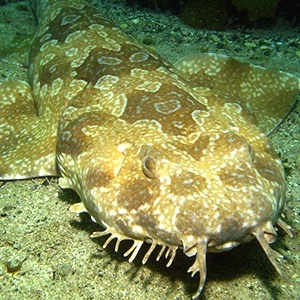 While the 12 species of wobbegong vary in length - between 2.5 and 9.5 feet - these "carpet sharks" all blend in seamlessly with the ocean floor, hidden from predators and prey alike. This nocturnal hunter will often lie still, waiting for prey to swim too close, attracted to the tentacles around the shark’s mouth that act as lures. Sometimes the wobbegong will also slowly wave its tail, mimicking a fish, which attracts other fish. Learn more. Image from Flickr. The camouflage colors of the spotted wobbegong are used in this palette, mimicking the sand and shadows of the ocean floor. 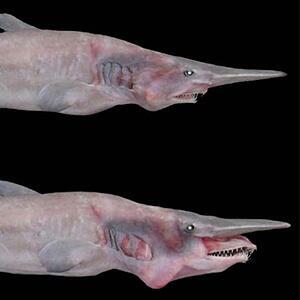 With its pointed snout and protruding jaw, the goblin shark is one of the strangest-looking sharks in the deep sea. Goblin sharks live along continental shelves around 4,000 feet deep, making them an incredibly rare species to come across. Learn more. Image from Phys.org. This unusual pink shark deserves an equally unusual color palette of muted pinks and purples. 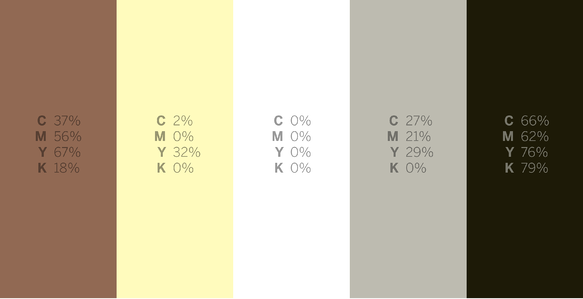 Have you found a favorite shark inspired color palette? Let us know! 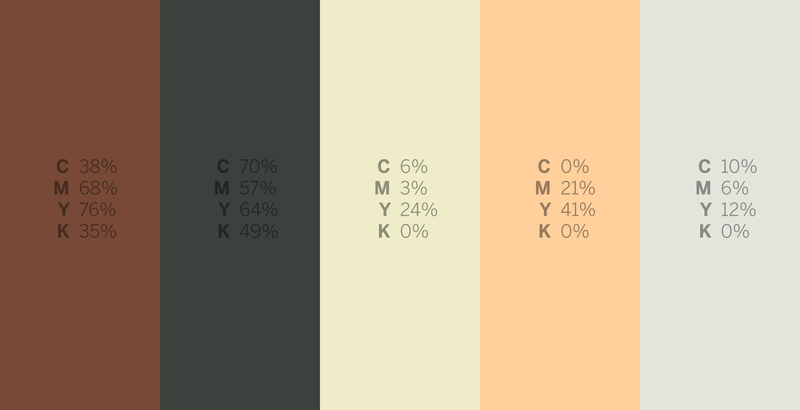 Or, try your hand at making your own color #sharkweek color palettes at Coolers.co!